Explore life as a pioneer on the Illinois prairie when you visit the Powers-Walker House at Glacial Park, in Ringwood, on Oct. 6. Through Oct. 19, Thu. 2-7 p.m. Featuring fresh produce, meats, pastries and bread, flowers and other items from local farmers and producers.Park Avenue and Cook St., Barrington, barringtonfarmersmarket.com. Through Oct., Tues. & Sat. 8 a.m.-1 p.m. On historic Woodstock Square, shop for fruit and vegetables, flowers, cheese, eggs, pet treats, bakery items, candles, olive oil, pottery and more. In Nov., moves to McHenry County Fairgrounds. Historic Woodstock Square, Woodstock, (815) 338-5164, woodstockfarmersmarket.org. Through Oct., Thur. 9 a.m.-2 p.m. Outdoor farmers market featuring vegetable, fruit, bread, meat, baked goods, flowers and spices. 200 N. Grove, Elgin, (847) 488-1456, cityofelgin.org. Through Nov. 12, Sun. 9 a.m.-2 p.m. Vendors sell fresh produce, flowers, baked goods, jewelry, handbags and more. Fourth and South Streets, downtown Geneva, (630) 232-7494, geneva.il.us. Sept. 17, noon-4 p.m. See a stone grinder, flintknapper and others demonstrate prehistoric skills; try your hand at throwing an atlatl to hunt big game; a mounted cavalryman explains the archaeology of the Little Bighorn site. Powers-Walker House, Glacial Park, 6316 Harts Road, Ringwood, (815) 678-4532, mccdistrict.org. Sept. 22-24, Fri. 6-10 p.m., Sat.-Sun. 10 a.m.-6 p.m. From cakes and pies to popcorn and martinis, apple-inspired treats abound during this three-day event, which features live music daily. Downtown Long Grove, 308 Old McHenry Road, (847) 634-0888, longgrove.org. Sept. 23, 1-4 p.m. Round up the family and kick up your heels during a fun-filled afternoon of downhome entertainment, including live music, dancing and games. Rakow Branch, Gail Borden Library, 2751 W. Bowes Road, Elgin, (847) 531-7271, gailborden.info. Sept. 23-24, 10 a.m.-4 p.m. No need for a passport; experience authentic music, dance, cuisine and more in one weekend. Morton Arboretum, 4100 Ill. Rt. 53, Lisle, (630) 968-0074, mortonarb.org. Sept. 24, 1-4 p.m. Experience the lives and cultures of French Canadian traders and the Native Americans who lived in this area in the 1600s and became intertwined in Metis villages. Crafts to follow. Prairieview Education Center, 2112 Behan Road, Crystal Lake, (815) 479-5779, mccdistrict.org. Sept. 30, 8 a.m.-4 p.m. Enjoy pony rides, petting zoo, pumpkin train, pumpkin bowling, clowns, face painting, wagon rides, scarecrow and apple pie contests, craft fair, Johnny Appleseed actor and live music. Downtown Crystal Lake. Info: (815) 479-0835, downtowncl.org. Sept. 30, 8:30 a.m. This 5K trail race goes through woodland, prairie and riverfront habitats. Enjoy the colors of fall along the wooded trail. Ages 14 and up. Reg. online. Meet at Hickory Grove Highlands, Shelter 2, 500 Hickory Nut Grove Road, Cary, (815) 338-6223, mccdistrict.org. Sept. 30-Oct. 1, Nov. 4-5, Dec. 2-3, Sat. noon-5 p.m., Sun. 7 a.m.-4 p.m. Hundreds of dealers comprise one of the longest-running antique markets around. Kane County Fairgrounds, 525 S. Randall Road, St. Charles, (630) 377-2252, kanecountyfleamarket.com. Oct. 1, 6 a.m.-noon. Participate in a 2-mile run, 20K bike ride and another 2-mile run through Crystal Lake and Lakewood. Proceeds benefit the Lakeside Legacy Foundation. Dole Mansion, 401 Country Club Road, Crystal Lake, (815) 459-1883, lakesideartspark.org. mile road rides. Proceeds benefit Special Olympics Illinois. Sycamore Speedway, 50W086 Ill. Rt. 64, Maple Park. Info: (224) 325-8177, soill.org. Oct. 6-8, events daily. More than 100 handcrafted scarecrows on display. Huge juried craft show, carnival, food, live entertainment, many free children’s activities, more. Downtown St. Charles, (630) 377-6161, visitstcharles.com. Oct. 6, 5-8 p.m. Enjoy the fall colors in Lost Valley Marsh and the twilight ambiance of the 1850s Powers-Walker House. Savor the smell of goodies baked in the wood-burning stove and see how early settlers finished their work in dim lighting. Powers-Walker House, Glacial Park, Ringwood, (815) 678-4532, mccdistrict.org. Oct. 7, 1-5 p.m. Sample more than 60 unique American craft beers while enjoying live Bluegrass music. Net proceeds benefit Adult & Child Therapy Services. Location: Clay & Bartlett Streets, Woodstock, (815) 338-2436, woodstockalefest.com. Oct. 8, 7 a.m. to dusk. This family-friendly day includes a 1K walk and a 5K “Bull Valley Monster Hill Challenge.” Features local food vendors, beer & wine tasting, a German band and games for the kids. Stickney House, 1904 Cherry Valley Road, Bull Valley, (815) 459-4833, bullvalleydays.net. Oct. 9, 6-7:30 p.m. Make a Victorian Halloween treat cone in the spirit of Halloween 140 years ago. Set in the Muller family house, where previous owners made pop in the basement and created what became the Arlington Club Beverage Company. Reg. req. Arlington Heights Historical Museum, 110 W. Fremont St., Arlington Heights, (847) 255-1225, ahmuseum.org. Oct. 12, 6-9 p.m. Visit several downtown eateries and discover the ties St. Charles has to U.S. history. Food and trivia fun at each stop. Reg. online. St. Charles History Museum, 215 E. Main St., St. Charles, (630) 584-6967, stcmuseum.org. Oct. 14, 5:30-8:30 p.m. Drop in for educational games, activities, crafts, snacks and hot beverages. Take a horse-drawn wagon ride that highlights migrating birds visiting the wetlands and Nippersink Creek. Lost Valley Visitor Center, Glacial Park, Ringwood, (815) 678-4532, mccdistrict.org. Oct. 20-21, 6:30-10 p.m. Experience two of the darkest nights of the year with 12 acres of haunting creatures. Historical buildings are turned into Frankenstein’s Laboratory, a Victorian insane asylum, a torture dungeon and a journey through the underworld. Ages 8 and up. Naper Settlement, 523 S. Webster St., Naperville, (630) 420-6010, napersettlement.org. Oct. 20-22, 9 a.m.-5 p.m. Fresh produce to purchase or pick, tractor rides, plant sales, pottery, folk art, antique dealers, barn sales, pumpkin and apple launchers, and much more, as you make your way down country roads on this self-guided tour. Starting point at 16105 Garden Valley Road, Woodstock, autumndrive.net. Oct. 21, 1-4 p.m. Bring back the Big Woods of McHenry County by helping to plant more than 200 oak trees. Along a half-mile trail, learn about oaks, play an oak-themed game or create a craft. Enjoy live music; bring a picnic or visit a food truck. Marengo Ridge, 2411 N. Ill. Rt. 23, Marengo, (815) 338-6223, mccdistrict. org. Oct. 21, 6-11 p.m. Party in the “safe zone” during a zombie invasion. Live entertainment, costume contest, food and other vendors, live graffiti artists, hookah lounge and special guests. Downtown Elgin, between Douglas Avenue and Villa Court, nightmareonchicagostreet.com. Oct. 25-29, events daily. Thousands of decorated pumpkins, crafts show, entertainment, carnival, 10K race, food vendors, parade on Sunday. Downtown Sycamore & various locations, sycamorepumpkinfestival.com. Oct. 28, 10 a.m.-noon. Children are invited to put on a costume, bring a bag and collect treats before heading over to the Crystal Lake Plaza for an afternoon of Halloween fun. Main Beach, 300 Lakeshore Dr., Crystal Lake, (847) 459-0680, crystallakeparks.org. Oct. 28, 10 a.m.-1 p.m. Costume contest at Martin Memorial Plaza and trick-or-treating at downtown stores. Downtown Wheaton, (630) 682-0633, downtownwheaton.com. Oct. 31, 4-5 p.m. Festivities include a costume contest and trick-or-treating around the Square. 121 W. Calhoun St., Woodstock, (815) 338-4301. Nov. 3, 7-8:30 p.m. Gather around the campfire to find out more about the adaptations and social life of the “prairie wolf.” Hike to listening spots and enjoy a favorite campfire snack. Reg. online. Prairieview Education Center, Crystal Lake, (815) 479-5779, mccdistrict.org. Nov. 4, 10 a.m.-2 p.m. Register your team to compete in a jigsaw puzzle tournament for prizes. The Racket Club, 9101 S. Ill. Rt. 31, Crystal Lake, (847) 459-0680, crystallakeparks.org. Nov. 5, noon-4 p.m. 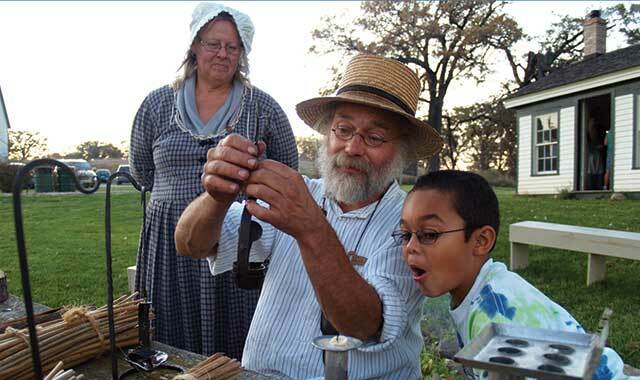 Step back in time to try your hand at corn shelling, grinding corn into flour or making a corn husk doll. See bread baking in a wood-burning stove and visit with a Cavalry sergeant and his horse as they demonstrate the weapons used to protect these frontier lands. Powers-Walker House, Glacial Park, Ringwood, (815) 678-4532, mccdistrict.org. Nov. 11, 3:30 p.m. Take a ballet lesson with real dancers, then watch them perform part of “The Nutcracker” ballet. Ages 6 and up. Reg. req. Gail Borden Public Library, 270 N. Grove Ave., Elgin, (847) 742-2411, gailborden.info. Nov. 12, 4-5 p.m. Travel back to 1917 and experience how American families faced “the war to end all wars.” Learn the history, experience the sights, sounds and tastes of the early 20th century. Century Memorial Chapel, Naper Settlement, Naperville, (630) 420-6010, napersettlement.org. Nov. 19, 2-3:30 p.m. Celebrate National Puzzles and Games week and some of the silly national “holidays” that come around each month. Activities for kids of all ages. Reg. online. Arlington Heights Historical Museum, Arlington Heights, (847) 225-1225, ahmuseum.org. Nov. 24, 7 p.m. Start off the holiday season as Santa Claus comes to downtown Crystal Lake. There’s lights, music, a pageantry and lots of holiday magic. Downtown Crystal Lake, (815) 479-0835, downtowncl.org. Nov. 24, 5-9 p.m. Thousands of twinkling lights illuminate the square as retailers, restaurants and entertainment venues offer specials designed to start off the holiday season. Woodstock Square, Woodstock, woodstockil.gov. Dec. 1, 11:30 a.m.-3 p.m. Join your friends for a delicious dinner and Edizon Dayao’s Big Band variety show. Reg. by Nov. 17. Pottawatomie Community Center, 8 North Ave., St. Charles, (630) 513-6200, stcparks.org. Dec. 1, 6-9:30 p.m. Welcome Santa Lucia, see Santa lighting the great tree, take a carriage ride, enjoy roasted chestnuts, strolling carolers and a live nativity. Join the house tour to see five distinctively decorated homes. Location: Downtown Geneva. Info: Geneva Chamber of Commerce, 100 S. 3rd St., Geneva, (630) 232-6060, genevachamber.com. Dec. 2, 9 a.m. A 5K/10K race that raises money and awareness for mental health services through TriCity Family Services. Prizes for best spirit wear costumes and top 5K and 10K runners. Location: Royal Fox Country Club, 4405 Royal & Ancient Dr., St. Charles. Info: (630) 232-1070, tricityfamilyservices.org. This entry was posted on Tuesday, September 12th, 2017 at 11:57 am	and is filed under Recreation & Destinations. You can follow any responses to this entry through the RSS 2.0 feed. Both comments and pings are currently closed.